If whiling away the hours in a luxurious pool or getting a massage is your idea of heaven, the good news is that you’re spoilt for choice when it comes to picking a spa in the UK. We’ve rounded up some of the best, from the big names frequented by the rich and famous, to quirky rural hideaways, historical wonders and those with pools with a view. The only remotely stressful part of the experience will choosing which indulgent experience you fancy. The Bamford Haybarn Spa is a wellness retreat in the Cotswolds, situated next to the famous Daylesford Farmshop. The spa has a holistic approach to wellness, offering treatments for the mind, body, and spirit. The Haybarn offers a broad range of treatments, each guided by a "deep respect for Ayurveda". You can select a variety of massage, facial and stress reduction therapies, each holistic in approach. As well as treatments, the Haybarn Spa offers a range of activities including yoga, pilates, and meditation in a magnificent yoga studio, complete with a wood-sprung floor occupies the top floor of the spa. The Dormy House Spa is all about making you feel absolutely fabulous, and has been winning awards since the day it opened. The spa offers guests an indoor/outdoor blend of soothing therapies, serene pool, terrace hot tub, and Scandi-style thermal suite. A range of individual spa treatments are only bookable for guests staying at the hotel, while non-resident guests are invited to book a spa day. The House Spa is made up of The Bathing Room, housing 16m indoor infinity pool illuminated with candlelight; The Thermal Suite, a set of Scandinavian inspired rooms designed to soothe, cleanse and invigorate; and The Spa Terrace, housing a hydrotherapy hot tub where warm-water jets massage away stresses and strains on even the frostiest winter days. In the grounds of the impressive country house sits this timber and glass spa, topped with a ‘living roof’ of thyme and lavender. It's an impressive building, housing a blue-lit pool with underwater music, steam rooms, mood showers and a gym. There are eight light-filled treatment rooms which offer a nicely edited treatment list by the likes of Carol Joy London, Kerstin Florian and Aromatherapy Associates. The Spatisserie serves up light lunch snacks such as salads and wraps, or, if you'd prefer something more substantial, you can eat in the one Michelin-starred restaurant at the hotel. Built around a 20-metre indoor pool, Ned’s Club Spa is a space in which Londoners can unwind without leaving the city. Complete with a sauna, steamroom, traditional Moroccan hammam and eight Cowshed treatment rooms, it's a one-stop-shop for women's and men's beauty and grooming. The beauty and grooming spaces at The Ned bring together a range of men’s and women’s services in a relaxed and unpretentious atmosphere. Here, you can book in for treatments from the signature Moody Massage to Dermalux LED Phototherapy, VitaDrip® infusions, and our exclusive Urban Warrior pollution proof facial from de Mamiel. The Ned offers a day spa, whereby members of the public can access Ned’s Club Spa when they spend £200 per person on any treatments in Cowshed. This five star hotel comprises two separate estates in the beautiful Lake District, with a luxury country house on each. At Gilpin Hotel all of the 25 bedrooms have lovely Lakeland views, most leading directly onto the gardens – including six Garden Suites with their own cedarwood hot tubs, and five fabulous detached Spa Lodges. The Spa Lodges are cedar-clad with king size beds, gorgeous bathrooms and a fabulously private en-suite spa each, with a convertible treatment area, steam room, rain maker shower, free standing oval stone bath, outdoor sauna and hydrotherapy hot tub surrounded by a walled garden. Add this to the mood lighting, fires, electric blinds and a state-of-the-art music system, and all of the senses are invigorated. In the evening chauffeurs bring you to the hotel in the evening to dine, either at the Michelin starred main restaurant, 'Hrishi', or in 'Gilpin Spice' a new informal restaurant focussing on dishes from the spice trail. You can thank the Romans for spa culture. And Bath's Thermae Spa is one of the original and best. The day spa lets visitors bathe in Britain's only warm mineral-rich waters just as the Celts and Romans did 2,000 years ago, but while the site may be ancient, the facilities in the spa definitely are not. Guests can dine at a swanky restaurant, choose from numerous treatments in plush private rooms, take a dip in the Minerva Bath or take in views of the beautiful city of Bath from the rooftop pool. There's even a Twilight Package that lets you enjoy a light meal and evening at the spa, taking in a spectacular sunset from the pool (if you're lucky). If clinical modern surrounding do nothing to relax you, why not consider Harrogate’s beautifully restored Victorian Turkish Baths. Visitors can start their visit in the Frigidarium, surrounded by a beautiful mosaic floor, Islamic arches and Moorish design while they get used to the temperature of the baths, then make their way into the equally stunning steam room, which is designed to relax the muscles, open the pores and let visitors kick back in eucalyptus-infused steam. Braver visitors can take the plunge in the cold plunge pool then warm up again in the steam room. (Some say this is invigorating and good for you.) But for those who prefer more pampering, the spa also offers an array of treatments as well as complementary and alternative therapies. If you’re looking for more than a day spa experience, Galgorm Spa & Golf Resort might be for you. There’s a luxurious hotel, restaurants, ample grounds to wander around as well as a golf course, not to mention the thermal spa village. The spa offers all the usual massages and facials as well as a riverside bathing experience where guests can relax in a hot tub and take in the scenery, and Rasul. To the uninitiated, this is the ancient art of cleansing where the skin is exfoliated with Dead Sea salt to remove dead skin cells, then a mineral-rich mud is applied (by the visitor rather than a therapist). Then, it’s a matter of setting back and relaxing the Arabic-inspired chamber while heat and steam dry the clay out and leave your skin glowing (apparently). The spa caters to groups and this is one experience that’s ideal for friends. Cowshed’s spa lies in the heart of trendy and idyllic Primrose Hill in London and is a favourite amongst celebrities. Homemade cakes, herbal teas and fizz are available in the farmhouse kitchen before treatments begin and the spa offers signature manicures and pedicures in a retro-tastic room with old fashioned TVs. There are six tranquil rooms for individual treatments, but the spa also caters for groups of between 12 and 20, making it ideal for parties. There’s also a shop selling its signature products so you can carry on pampering from home. For a spa retreat that caters for the whole body, Herb House Spa at the Limewood hotel is a great choice. Nestled in the New Forest, the spa has a massive Sauna and indoor Hydro Pool with stunning views, a mud house, a steaming outdoor hot pool, eight spacious single treatment rooms and two magnificent double treatment rooms. The spa will soon offer Sarah Chapman facials. There’s also a state of the art rooftop gym, a 16-metre ozone treated indoor lap pool with glass doors overlooking the garden and a workout studio where you can get stuck into a fitness class, personal training session or fitness MOT. After all that exercise and pampering you’ll probably be hungry and the Spa has a Raw & Cured food bar offering natural and healthy food, including freshly made salads, cured fish and meat from Lime Wood’s own Smoke House; as well as fresh juices and smoothies. If you’re after sparkles and glamour this one might not be for you, but its Instagram-friendly surroundings, treatments and food make it one of the trendiest spas around at the moment. A stone’s throw from one of London’s busiest railway stations and the Eurostar, lies St Pancras Spa in the original underground kitchens of the St Pancras Renaissance Hotel London. The spa takes its styles from the breathtaking Victorian architecture of the Hotel, as well as around the world. As well as an incredible variety of massages and treatments, the spa offers ‘journeys’ or collections of treatments inspired by a particular part of the world. There are also day passes for people who want a break from the city or a relaxing day before hopping on the train to Paris. tennis courts, a dance studio, gymnasium, nine hole golf course and a 17m indoor pool, and for those who like to relax, there’s a hydrotherapy spa pool, nail studio, aromatherapy saunas, crystal steam rooms and twelve individual treatment rooms offering 50 different treatments and therapies. Visitors can enjoy a treatment or two featuring quality products from the likes of Natura Bissé, Mama Mio and Oskia, take a stroll on the beach and enjoy pretty much any healthy food they like as the Pool Bar even offers an Alkaline Buffet. Lucknam Park is an unspoilt country house with 42 individually styled rooms and a choice of fine dining featuring local produce in the Michelin starred Restaurant Hywel Jones or a more relaxed meal in The Brasserie. There are 500 acres of parkland you can explore on horseback (if you like) as well as a cookery school and last but not least, the spa. The facilities are amazing, with the spa boasting a 20metre indoor swimming pool, indoor and outdoor hydrotherapy pool, outdoor salt water plunge pool, eight treatment rooms and thermal cabins featuring Japanese salt, amethyst room, aromatic steam, sauna and Tepidarium. Then of course there’s a gym, rooms for fitness classes and personal training sessions, tennis courts and even a football pitch (really). With its luxury tented treatment rooms lit by lanterns and its far-reaching views over Mawgan Porth, the Scarlet Spa does things a little differently. 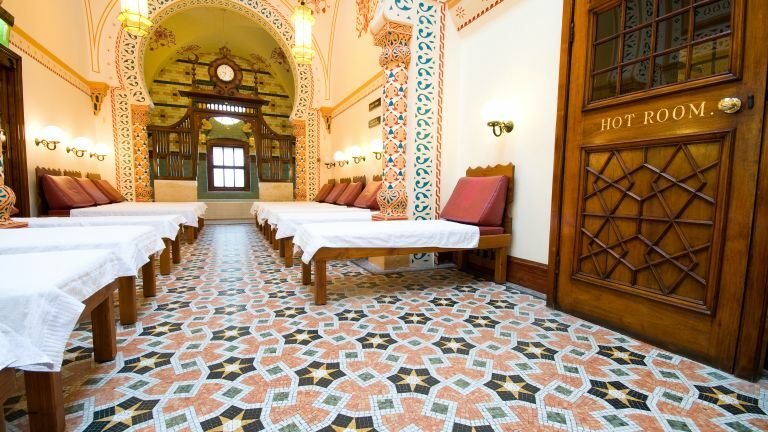 Its focus is about visitors’ holistic wellbeing and it offers treatments including slathering yourself in rich mineral mud in the rhassoul, experiencing a traditional bathing ritual in the hammam, or even learning how to give massages. There’s also a big focus on the great outdoors and the spa has a cliff top hot tub allowing users to watch a sunset or even stargaze. Plus, there’s a chemical-free swimming pool too. The relaxation room has cocoon-like pods hanging from the ceiling, letting its users can drift to sleep following a treatment and there are loads of other features too. Visitors can check in for the day, or stay in the hotel and dine in the restaurant too. Little White Alice’s Wild Spa is a little different to the usual swanky set ups in country houses. Instead, it’s part of a 28-acre sustainable sanctuary set in an ancient granite landscape in Cornwall. There’s a natural reserve, veggie garden and rare breed farm to get back to nature and guests can stay in eco-cottages and arks. The spa itself is powered by the sun, wood and wind and has a sauna, hot tub, and bucket shower for brave types who love getting freezing then warming up again. The south-facing sanctuary is perfect for yoga and spa treatments, as well as being the perfect spot to unwind with a book. Accommodation is geared up for families, so this set-up may be perfect for parents looking to get a few minutes peace while having a family holiday at the same time.